These large, ground-dwelling squirrels are a symbol of the Alps and other mountain ranges. They are easy to recognise from their cute, cuddly appearance, but how much do you know about everybody’s favourite mountain rodent? Four extinct species have also been identified in the fossil record. The alpine marmot (Marmota marmota) is only found in Europe and is the only marmot you will see in the Alps. Marmot species found in North American mountains include the hoary marmot (Marmota caligata) and yellow-bellied marmot (Marmota flaviventris). Not all marmots live in the mountains. The groundhog (Marmota monax) is one of the lowland dwelling marmots. Marmots are recognisable by their shrill, whistling alarm calls. The alpine marmot uses a different call depending on the type of threat. A single, piercing whistle warns against a predator in the air – often an eagle. A series of whistles denotes danger on the ground. Studies of North American marmot species have not found the same correlation between threat type and alarm call. Marmots live in family groups with a distinct hierarchy. Each family is headed by a dominant male and female marmot, and only this couple are permitted to mate each year. The dominant female ensures that this rule is kept to. The family has its own burrow which might be enlarged over successive generations until it becomes a complicated warren. All the marmots sleep together in the main sleeping chamber, the hibernaculum. Different DNA studies have found that between 2.2% and 13% of marmot offspring have a father other than the dominant male, with young from the same litter sometimes having more than one father. Marmots hibernate for around two hundred days per year, losing around a third of their body mass. During this period, they live off their reserves of fat. They do not sleep constantly but have short periods of wakefulness which are believed to help regulate their body temperatures. Newborn marmots spend the first months of their life racing to eat enough to survive their first hibernation. Marmots are often known as whistlepigs or whistlers in Canada, due to their distinctive calls. 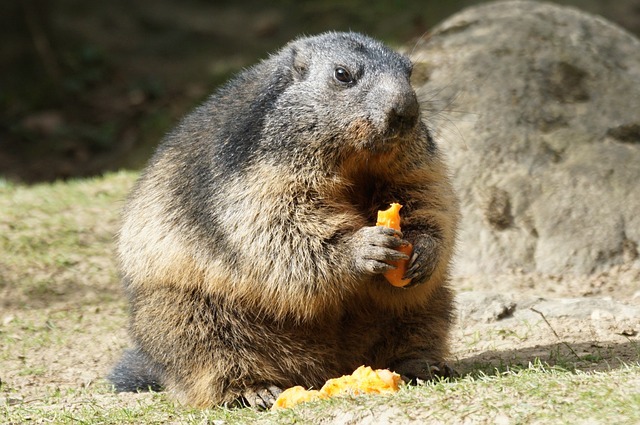 The ski area of Whistler was re-named after the marmots which live there when it was developed as a resort. The original name was London Mountain, due to the rainy, foggy climate. For some reason, the new name was considered more attractive to tourists. After the Americas split from Eurasia around forty million years ago, rodent species evolved independently on both land masses. Marmots first appeared around 15 million years ago in North America. Eurasian marmot species have evolved from marmots that crossed the Bering Strait into Eurasia around one million years ago. 2500 years ago, Herodotus, the ancient Greek historian, wrote about large golden ‘ants’, bigger than foxes, which were used to find gold in the ancient Persian empire. Long dismissed as a fabrication, research from the mid-1990s suggests that Herodotus’s ants were golden marmots in what is now Pakistan. The ancient Persian word for marmot means mountain ant. The marmots there burrow in sandy, gold-bearing soil. Local tribesmen would extract gold from the sand that was carried to the surface on the marmots’ fur.